This juvenile Red-tailed hawk was perched in a tree on the roadside running along the Great Salt Marsh. She was hunting a squirrel that was half hidden in the leaf litter below. This is the second time in the past several weeks that we’ve seen a Red-tailed Hawk hunting and eating a squirrel. The first was in our neighbor’s yard, perched on the stone wall, eating a Gray Squirrel. The Red-tailed flew overhead with the squirrel in its beak and landed on the lattice of our outdoor shower enclosure. My husband stood beneath the shower ceiling and watched for a bit as the hawk finished off his meal. 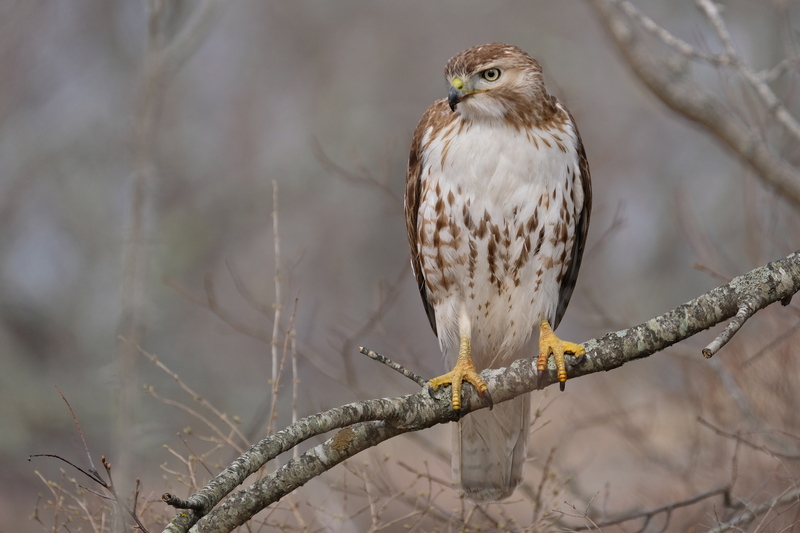 The Red-tailed Hawk’s diet is highly variable, consisting of small mammals including voles, mice, rats, rabbits, and squirrels; other birds including bobwhite, starlings, blackbirds, ducks, and pheasant; reptiles such as snakes and frogs; fish; insects; bats; and carrion. They are colloquially called “chickenhawks” however, they rarely take a standard-sized chicken. The Red-tailed Hawk is the most common bird of prey found in North America. We saw several in Mexico on our trip to Cerro Pelon in early March. They are found from the interior of Alaska and northern Canada to as far south as the West Indies and Panama.